Touring Game of Thrones filming locations is at the top of my bucket list. I haven’t had the chance to get to any yet, but I have plans in the works! Until then, I asked some of my travel blogging friends to share their experiences. Just 40 minutes from Belfast, the U.K.’s National Trust has preserved Castle Ward, the eccentric 18th century mansion and grounds that belonged to the Ward family since 1570. With the help of CG technology, the Georgian farmyard of Castle Ward is Winterfell, and the acres of gardens, forest, and buildings stand in as the castle yard and tower that are instantly recognizable since Season 1, Episode 1. 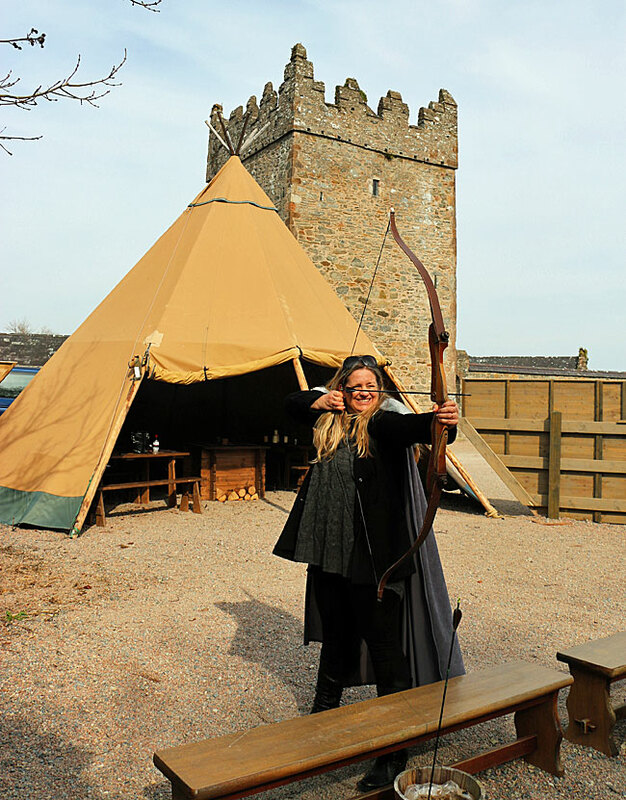 The Archery Experience at Castle Ward, a Game of Thrones filming location. Photo by Corinne McDermott. Winterfell Tours facilitates hikes and self-guided bike tours nearby of a number of key locations throughout the series. The Archery Movie Set Experience is a must-do: Dress up in costume and learn archery using ancient bows and arrows in the same spot the Stark boys practiced theirs. If things look suspiciously familiar as you travel up the northeast coast of Northern Ireland, it’s because they are. The area known as the Glens of Antrim is bursting with Game of Thrones locations. The rugged green hills against the Irish Sea are the backdrop for many scenes in the North and even north of The Wall. And the spillover parking lot for the famous Carrick-a-Rede rope bridge is where we first met Brienne of Tarth when she defeated Ser Loras in a swordfight. However, you’d never recognize Ballintoy Harbour. During nice weather, Irish families gather at this picturesque inlet for picnics and to cool their toes in the chilly Atlantic. The delightful tea room nearby has the most delicious Irish Stew. It’s actually the location of the grim Lordsport Harbour of the Iron Islands, confirmed by a picture of poor Theon Greyjoy (aka Reek). 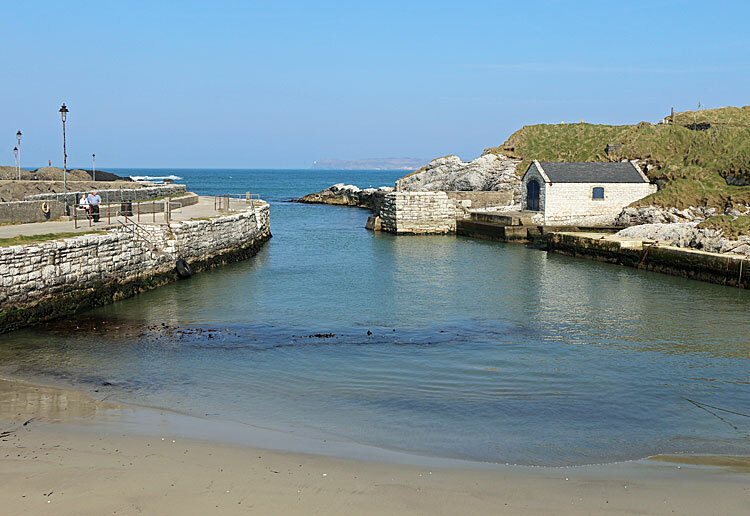 Ballintoy Harbour – a Game of Thrones filming location. Photo by Corinne McDermott. Read more from Corinne at HaveBabyWillTravel.com. Romantic and magical Girona, Spain is located just 98 km from Barcelona near the French border. Wandering the narrow alleys and cobblestone streets is like stepping right into a Game of Thrones set! To those in the know, Girona’s historic medieval center is otherwise known as GOT’s Braavos, Oldtown, and Kings Landing. The Sant Pere de Galligants monastery was the setting of the Oldtown Citadel where Samwell Tarley trained to be a maester. Girona’s festival square, known as the Placa dels Jurats, is where Arya Stark sat watching a play depicting the lives of the Lannisters, while also following orders to spy on the lead actress. The Banys Arabes (Arab Baths) appear in season 6, episode 8. Arya attempts to hide behind the 12th century Romanesque columns in the Arab Baths when being chased by the Waif. The street outside of the baths served as the atmospheric backdrop for the busy market. No visit to Girona is complete without exploring the grandiose Romanesque and Gothic Girona Cathedral. This was where Jamie Lannister and the Tyrell soldiers marched to halt Queen Margaery’s walk of shame in season 6, episode 6. Just imagine what it would be like to head up those steps on horseback as Jamie did! 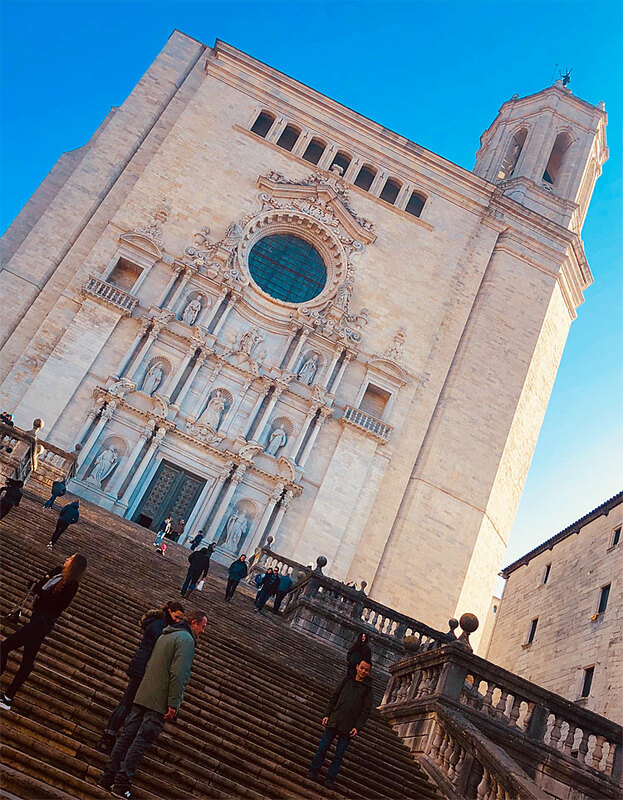 Margaery’s “Walk of Shame” stairs in Girona, Spain. Photo by Lisa Grabelle. Girona is a fabulous setting for your own vacation. Take in the dreamy architecture, fabulous views from the hilltop, delicious regional food, colorful riverside buildings… and imagine yourself starring in Season 6 of Game of Thrones! Read more about Lisa’s visit to Spain. Game of Thrones fans won’t want to miss a visit to Split, Croatia as it is less crowded than Dubrovnik, the city that started the GoT craze. Take a tour with Dino Ivančíć who is an expert in Split history and Game of Thrones lore. 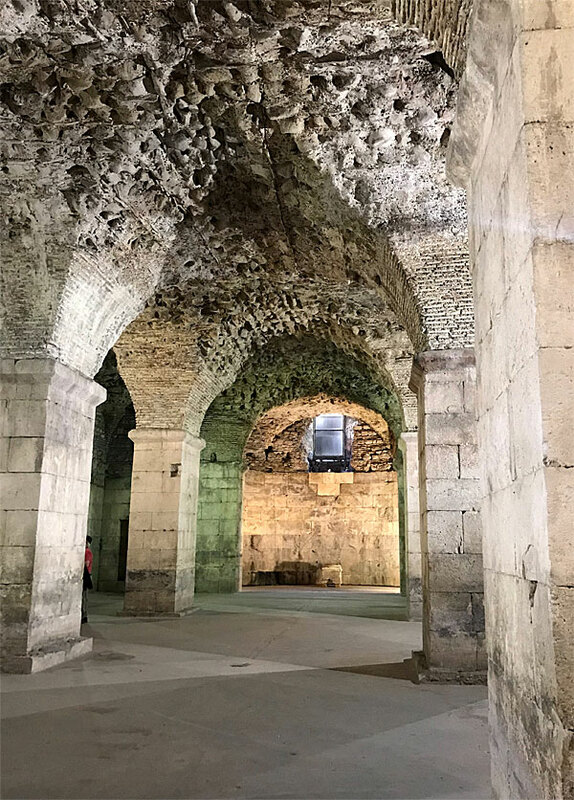 He will take you to explore the city’s main attraction, Diocletian’s Palace, home to the Emperor Diocletian in the 4th century AD, and lay the foundations of the city’s parallels with the Game of Thrones. You’ll explore the palace’s basement to see where Daenerys Targaryen kept her dragons as well as her throne room. Touring the basement alone is fascinating, but Dino will also help you find lesser known spots. You’ll see where the slave rebellion took place and other narrow cobblestone streets and alleyways where many Westeros scenes were filmed. Game of Thrones filming location in Split, Croatia. Photo by Kirsten Maxwell. If you have a car (or take a taxi or use Dino), you can visit the nearby Klis Fortress which was the setting for Meereen. We also explored the beautiful World Heritage town of Trogir which was used as the trading harbor of Qarth. Game of Thrones fans will not be disappointed with a visit to Split, and not only for its connections to the show. The beauty of this town is hard to surpass. Read more from Kirsten about her visit to Split, Croatia. 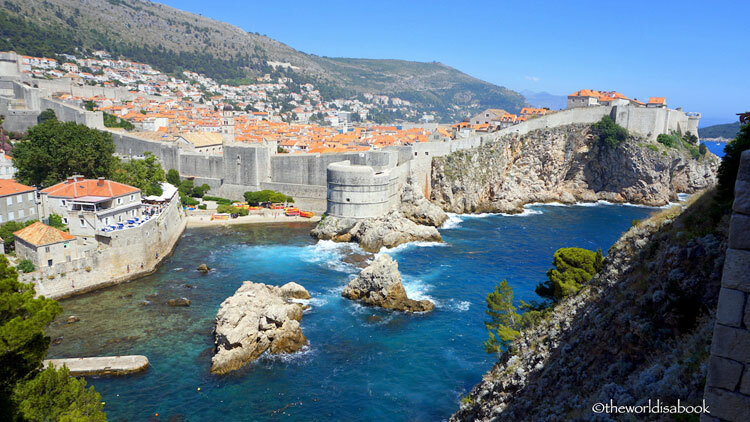 Visiting Dubrovnik, Croatia is an incredible experience especially for Game of Thrones fans. The walled city was the inspiration and a stand-in for King’s Landing. It was easy to see why they chose this city with its 14th century stone walls, charming buildings and fortresses. The Old Town area was well preserved and used for many GOT filming locations over the years. Dubrovnik – site of the walled city of Westeros. Photo by Mary Solio. 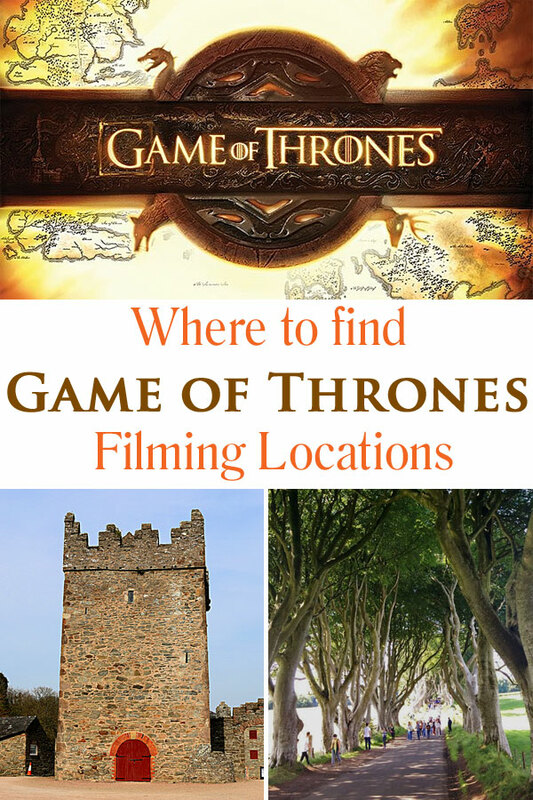 Many companies offer Game of Thrones guided walking tours to visit the show’s film sites. We really enjoyed our tour since it was also a great way to see the city and learn its history and culture. We loved spending time at the St Lawrence Fortress or Fort Lovrijenac perched on a sea cliff. This is known as Dubrovnik’s Gibraltar but it also doubled as the Red Keep and was used for many scenes including the tournament site during Joffrey’s name day. The nearby fishing harbor and dock have been used in many scenes as King’s Landing beach, usually shown when someone is sailing off. Walking around the pedestrianized areas of Old Town almost felt like being transported back in time. Its quaint streets have been featured in many King’s Landing scenes. We even had the chance to follow the route for Cersei’s famous “walk of shame.” A nearby bar at the Jesuit Staircase where the walk started actually had a “walk of shame” cocktail! Our tour guide pointed out many scenes filmed at buildings from the Ethnographic Museum used as Littlefinger’s brothel to The Rector’s Palace used as the Spice King’s mansion. Our tour ended at a small shop where we had the opportunity to sit on the coveted Iron Throne. It was a major highlight for us! Read more about Mary’s visit to Dubrovnik. 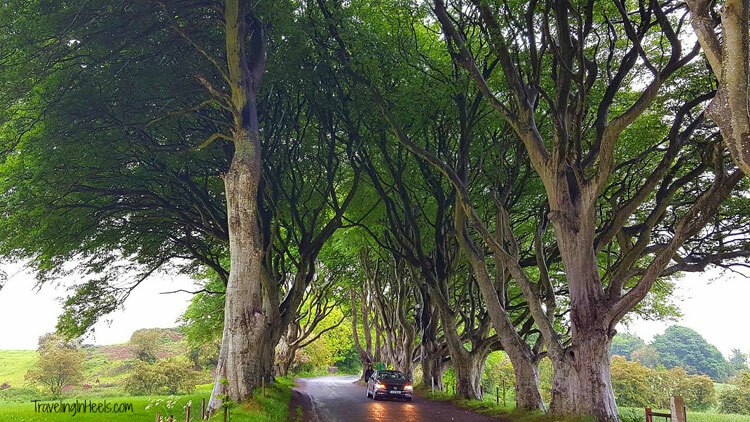 Planted in the 18th century by the Stuart family, the Dark Hedges is a tunnel of beech trees located on Bregagh Road between the villages of Armoy and Stranocum in County Antrim, Northern Ireland. This naturally built atmospheric passageway of trees was featured in season 2, episode 1 as the Kingsroad. During her escape from King’s Landing and dressed as a boy, Arya Stark traveled north on KingsRoad in a cart, with Yoren, Gendry, Hot Pie and others who embarked on a journey to join the Night’s Watch. No surprise on my June Coastal Causeway road trip, my detour to the Dark Hedges gifted me with a steady (and eerie) dose of Irish drizzle while I walked this row of trees (approximately 0.6 miles). The Dark Hedges, aka The Kingsroad, in Northern Ireland. Photo by Diana Rowe. CAUTION: Even in inclement weather, this is a busy tourist stop, so watch for traffic. Dark Hedges is free to the public, located about an hour’s drive from Belfast. Since my visit, this is pedestrian only. Parking available nearby at the Hedges Hotel, about 2 minute walk. Read more from Diana at TravelingInHeels.com. Before heading back to Belfast, we walked through the Dark Hedges, which doubles as The Kingsroad in Season 2. You’d recognize it, with its gnarled tree trunks and the almost pastoral-like setting along the path Arya and Gendry take on the way to Harrenhal. It was hardly pastoral the day we visited. It was jammed with coaches and cars, and people stopping in the middle of the road to take pictures. While searching for a coastal stop to break up our family road trip in Spain on our way north to Barcelona, I came across Peñíscola. The adolescent in me couldn’t help but giggle at the name, but once I saw the pictures, I was captivated. 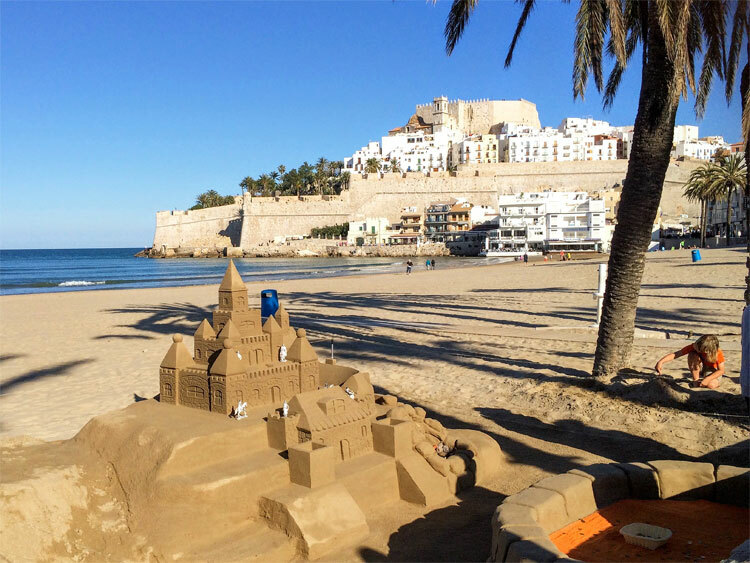 About 2.5 hours south of Barcelona and an hour and a half north of València, Peñíscola boasts a seaside castle built by the Knights Templar around 1300. It’s no wonder the Game of Thrones crew chose this as a filming location! Peñíscola was the perfect stand-in for the slave city of Meereen in season 6, especially given its similarity to another Meereen filming location, Klis Fortress in Croatia. Primary scenes filmed there include Tyrion and Varys strolling and discussing strategy to restore stability to the city after Daenerys disappeared on the back of one of her dragons – notably when Tyrion tries to give a woman money for her baby but, in his bad Valyrian, implies he wants to eat her baby instead (oops!). Meereen, aka Peniscola. Photo by Julia Slatcher. As for deserving a place on your itinerary, Peñíscola has a charming pedestrian center surrounding its atmospheric castle. White-washed houses, with their blue-trimmed windows and bright red geranium flower boxes, line the cobblestone alleys. We loved exploring the labyrinth of passageways, walking the outer walls with their stunning views of the Mediterranean, and then recharging at an outdoor cafe. Read more from Julia at Inspire World Travel. Visited by: Catherine D’Cruz of We Go With Kids. 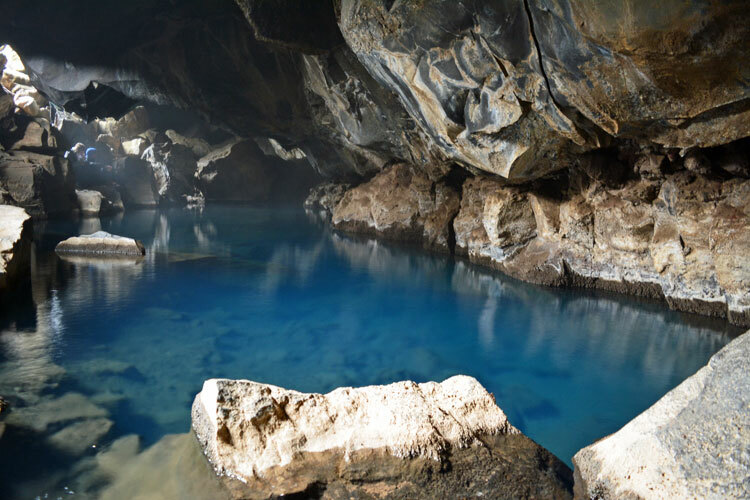 The Grjótagjá lava caves in Northern Iceland were the filming location for an iconic (but not kid-friendly) Game of Thrones scene with Jon Snow and Ygritte. We visited the caves while exploring the nearby Lake Myvatn with our three kids in June 2017. Grjótagjá was labeled on the map we received from the Tourist Information Center. There are two portals in the small lava cave that each have a thermal spring filled with blue water. The temperature in each varies but can be scalding at times. The cooler of the two springs was once a popular place for locals and tourists to bathe until it was prohibited several years ago. The caves are located on private property, but there was a nearby parking area and no charge to enter. The Grjótagjá lava caves, where Jon Snow & Ygrit got it on. Photo by Catherine D’Cruz. While all of the visitors were respectful during our visit, the caves were closed in July 2018 due to the inappropriate behavior of visitors who used the caves as bathrooms, washed shoes and dishes in the thermal springs and left trash. This sad closure is a reminder to be careful to leave no trace when visiting any landmark, especially a site graciously opened to the public by private landowners. Read more about Catherine’s trip to North Iceland. I hope this post has given you some good ideas on where to visit for your own Game of Thrones setjetting! I’ll be planning a visit to Ireland myself when HBO opens their “Game of Thrones Legacy” attractions. According to reports, they may include the standing sets for iconic locations from the show such as Winterfell, Castle Black and Kings Landing alongside a formal studio tour of Linen Mill Studios, which will showcase material from the series spanning all seasons and settings. I’ll have more to share with you then!